Named after La Sportiva's iconic Stratos full carbon fiber boots, the Stratos pack is designed as the perfect complement to those boots (or any others) on race day (or any others). With minimalism in mind, La Sportiva made the Stratos backpack just large enough to fit essentials and lightweight enough to win. The pack has big finger loops on the main zippers so you can open and close it in a hurry. The Stratos is the sister pack to the Spitfire, adding a durable crampon compartment and removing some yellow. Quick ski carry system for strapping on and taking off your skis without taking off your pack (tails up to ~105mm). Uses special lightweight yet strong fabric to reduce weight while not falling apart. Hip strap pockets for small items like a camera, inclometer, or energy gels. Internal compartments for shovel, probe and hydration system. Zippered side pocket for water bottle, shell, or anything else you need to grab with your pack on. Velcro side pocket on the other side for stashing crampons or rocks you are collecting. Ice axe loops on the back for technical rando races or light and fast ski mountaineering. Usage Everyday & race day ski mountaineering. Notes Has side access compartments on both sides. Bottom Line Durable skimo pack with quick access. I was wondering if this backpack has a velcro side pocket for crampons? I would prefer if it didn't have it :). If it has the side velcro pocket, would there be an alternative (e.g. Spitfire) that doesn't? Thanks for your time! 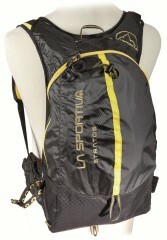 Hi Jakub, both versions of the Sportiva packs have the side pocket. Note it's a zip. Maybe I was too rash! After using this thing for awhile and realizing its limitations as well as its strengths I really like this pack. I have used it for everything from 30 mile long Alaska ski days, a day pack for high altitude corn snow in the Pamirs, loaded with fuel bottles and tied to a Mongolian Pony, as well as to carry my families rain coats while wandering through Amsterdam with a latte. Great pack! Get one or one like it. I admit it I bought it because it looked cool. After spending 2 hrs sewing on a brand new pack to fix some of the glaring design flaws I thought I had a pretty good lightweight ski pack. Unfortunately after a few weeks of use the skis started to abrade the cheap fabric to the point where I need to sew a protective patch. To be fair it is my first rando race pack and it probably is about as good as any other. I love the idea of putting your skis on and off your pack like some Highlander with his broadsword but I had to sew bigger loops for bigger skis, bungies for an extra coat, compression straps to keep the zipper from exploding, a real chest strap instead of tiny hook and eye bungie, and a new waist belt. A lot of work on a pack that is supposed to be specifically task built for skiing. Save your money and add a ski attachment system to your favorite day pack.